Sherry Gorslin, RN, WHNP, B.C. 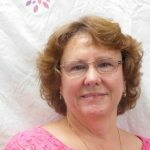 Sherry is a women’s health Nurse Practitioner who has over 20 years experience in the medical field. She is a licensed registered nurse with experience in obstetrics, labor & delivery, and the emergency department. Her experience with Family Planning Health Departments in two Arizona counties makes her invaluable to our patients seeking these services. Sherry is skilled in both 3-D and 4-D limited ultrasonography. .
Laurie is both a Nurse and a Counselor. Laurie received her BSN from the University of Texas at Austin in 1990 and has experience in pediatrics and women’s health, working as a traveling nurse for 5 years in Texas, Illinois, New York, Arizona, and California. 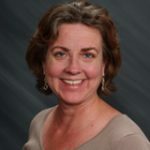 In addition to her nursing qualifications, Laurie holds a Master of Counseling and is a Board Certified Licensed Associate Counselor, with more than 11 years of experience performing limited ultrasound, including 3D and 4D imaging. Native of Mexico, Armida received her BA in Communications at Universidad del Noroeste. 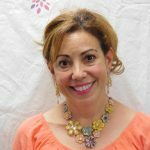 She is our Family Planning Consultant and is a Master Teacher on the FAF Method of NFP, which she has taught for almost a decade. .
Suri received her Certification as a Medical Assistant from Arizona College. A full time mom to two boys, she plans to return to school for her BSN degree. Her goal is to help women of low income get the help they need to take care of their children, and have access to affordable health care. She strives to empower women to provide for their family and themselves and overcome any type of abuse. 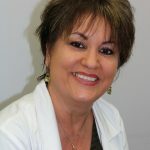 Teresita has a Nurse Aide Certification from Pima Medical Institute and is certified to interpret medical calls. She has worked as a Patient Care Technician in emergency room and labor and delivery units. She is also a full-time mom of 3. Terry’s plan is to return to school for her Bachelor’s Degree in Marriage and Family Counseling as well as Abuse and Rehabilitation. She wants to help women who are uninsured and low-income. Christy is a part-time staffer who helps us out periodically by performing limited ultrasounds for our clients. She is a Registered Diagnostic Medical Sonographer (RDMS) and received her training at Carrington College. She received her BS in Sociology from Arizona State University. She excels in needs assessment, listening and communication skill, and empathetic patient care. 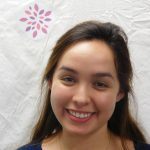 Eva, originally from Chihuahua, Mexico, is fluent in Spanish and as a Peer Counselor has helped many immigrants transition into the American health care system. She has started a post-abortion support group and has been instrumental in the success and popularity of our Learn to Earn program. Eva’s focus is on healthy families and ensuring that all women have access to healthcare. Jocy serves as Administrative Assistant to the Directors, and assists with client intake and counseling. She has been with Life Choices since 2016. She is currently pursuing a degree in occupational therapy. She enjoys patient to patient interaction and serving people to the fullest of her ability. .
Yahaira may be the first voice you will hear when you contact us, as she serves as Receptionist and Scheduler. 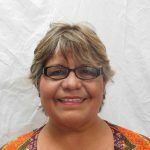 Yahaira is bilingual. .
Mary serves as Director of Finance, and helps out with both front-and back-office support. She received her Bachelor’s Degree from Arizona State University and Master’s Degree from the University of Phoenix. She uses her accounting skills to maintain and report financials, and her management skills for promotion and organizational tasks. 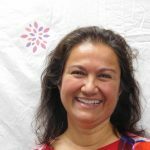 As Director of Life Choices Women’s Clinics, Sheila has a BS from the University of Illinois and over 25 years of experience in the health care. In 1986 she was a co-founder of ASK Women’s Center in Phoenix. ASK was established to provide support to women in the community. Over the years the mission and services have been expanded to include medical care, counseling and direct aid. Ashley provides backup support with nursing and ultrasound services on a scheduled basis. She received her degree in Nursing from Liberty University. She has received certification in Maternal-Child Critical Care. Her focus is on communicating with mothers to support a healing environment. Ashley is currently working full-time as a labor and delivery nurse. 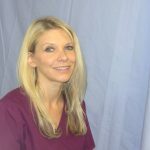 Jennifer provides backup support with nursing and ultrasound services on a scheduled basis. She is bilingual and has excellent listening and communication skills. Jennifer is currently working full-time utilizing her nursing degree in a hospital setting. Dominique discovered she was pregnant and called life Choices Women’s Clinics seeking information about abortion. At the clinic, she met the nurse and received an ultrasound that changed everything. She was offered words of encouragement and counseling from caring staff that gave her hope. She left the clinic “excited and scared” putting her trust in God. 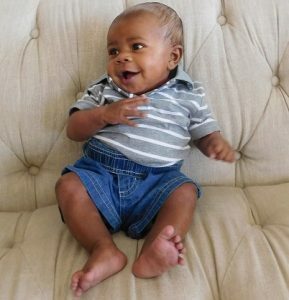 She now has a precious little boy named Elijah. I had found myself lost and without a way out. We had just lost our apartment and all our belongings. To me, the news of me expecting another child felt like I could not bring another child into this world. This baby was going to be #5. I called Life Choices to get information on abortion. I made an appointment and when they did an ultrasound on me, I couldn’t believe what my eyes were seeing. My husband and I found ourselves feeling guilty of even thinking about abortion when such a precious gift from God was forming inside me. Life Choices changed my life, not only mine but also helped my family through the most difficult times. They helped us to keep our family together, and prevented us from homelessness. I was able to save up enough money to move into a place to call home. My family and I have been blessed with so much and Life Choices has been a big part of that. I am proud to say my blessings are my children, and I am the mother of 5 beautiful children. My 5th blessing is called Isabella. When I scheduled my appointment at the abortion clinic, I was struggling financially. The pregnancy left me feeling alone and very sick. Daycare was very expensive and I was already struggling. I had no support or family in Arizona, and I felt abortion was the only option. I prayed that God would take this pregnancy away. I called Life Choices Women’s Clinics looking for financial help with my abortion. They offered me help instead to carry my pregnancy to full term. It has not been easy, but Life Choices was there for me during a sad and difficult time. They walked me through my options and helped me make a decision I could live with. I realized that kids don’t ask to come into the world, or for their lives to be taken. 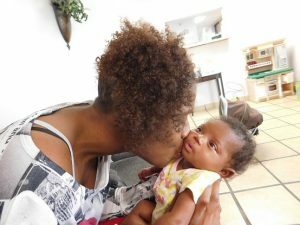 This baby was a part of me and I was now committed to helping my baby girl to live. After giving birth I was tired and in awe. It was all worth it. Life Choices has continued to be there for me after my pregnancy. I wanted to say thank you because your contribution helps a lot of families. 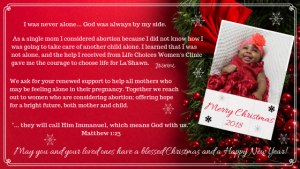 Keep up with the amazing stories about happening through the partners and staff at Arizona Pro Life. Just a little info and we can stay in touch.